Tido Music is a revolutionary digital subscription service offering a truly immersive, 360° experience for people discovering, learning and performing music. 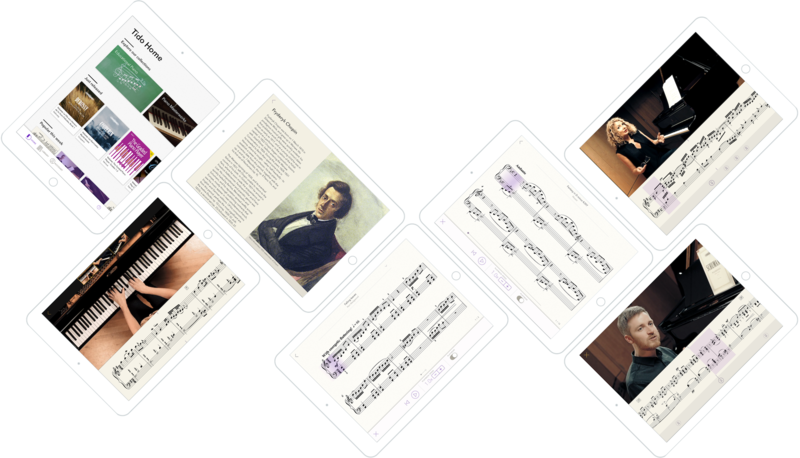 It connects an inspiring array of multimedia content, from sheet music, audio and video to text, images and interactive tools. The company was founded in 2013 when conductor and editor, Brad Cohen, collaborated with one of the world’s leading music publishers, Edition Peters. In 2015 we partnered with Faber Music to create the award-winning Mastering the Piano with Lang Lang app, and our flagship Tido Music app was released in late 2016. Tido works with renowned publishers, artists, exam boards and record labels including Bärenreiter, Edition Peters, Faber Music, Naxos and Trinity College London. Tido has brought together an international team with diverse talents, from software development, publishing and music performance to television broadcast, gaming and interactive design. Serving and understanding the needs of students, teachers, performers, publishers and enthusiasts is in our DNA. The speed-shift and pitch-shift features of our audio playback tool use the Rubber Band Library audio timestretcher by Breakfast Quay. Our vision is a world where people are deeply connected to the music they love.